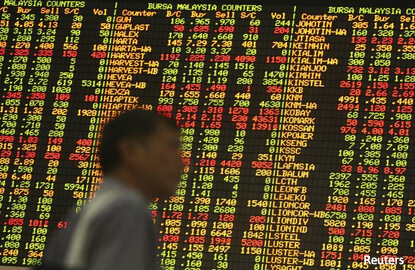 (March 17): Most Southeast Asian stock markets ended higher on Friday, buoyed by a weaker dollar as the US Federal Reserve did not signal a faster pace of monetary tightening. The US central bank delivered an interest rate increase on Wednesday as anticipated, but it did not alter its earlier forecast for a total of three rate increases this year. That disappointed some investors who had hoped for hints of a possible fourth hike in 2017 and for more aggressive forecasts for next year. The dollar index, which gauges the greenback against a basket of six major rivals, edged down 0.1% to 100.26. MSCI's broadest index of Asia-Pacific shares outside Japan gained 0.4%. "Regional markets gained as the dollar rally waned. They had been pricing in the rate hike since last week," said Victor Felix, an equity analyst with AB Capital Securities, adding that a stronger dollar had been pressuring blue chip stocks. "Dollar bulls are closing their positions towards the weekend and that has tapered out the rally," he said. Indonesian stocks gained 0.4% to hit a record closing high of 5,540.43 after the central bank kept the key interest rate unchanged and forecast a positive growth for the economy for the first quarter on 2017. The index rose 2.8% on the week, its biggest weekly jump since the last week of December. Financial and mining-related stocks led the gains, with Bank Rakyat gaining 3.8% and United Tractors adding 5.1%. An index of the 45 most liquid stocks rose 0.5%, bringing its weekly gain to 3.3%. Philippine shares rose 0.9% to hit its highest close in seven weeks and posted a 2.8% weekly gain. Financial stocks BDO Unibank and Ayala Land gained 1.8%. Singapore shares ended 0.2% up at its highest since August 2015, with Yangzijiang Shipbuilding gaining 4.1% and telecom company Starhub adding 2.1%. The index logged its sixth straight winning week, adding 1.2% on the week. Bucking the trend, Vietnam stocks fell 0.6% as industrial stocks FLC Faros Construction JSC and CII Bridges and Roads Investment JSC lost nearly 7%. The index lost 0.2% over the week.